One of our favorite ways to help the community is through utilizing our talents to fill the marketing and communication needs of local organizations. Through her involvement in local nonprofits, as well as her children’s school, Danielle encountered a desperate need for practical, attractive design on small budget. Consistently providing beautiful design solutions quickly earned us the reputation of being an effective and efficient partner for any organization. We give back to causes and organizations that enable and promote the great potential in our city. We stay involved in a wide variety of community groups and organizations, from nationally acclaimed American Advertising Federation of Shreveport-Bossier, to the next generation coming up at A.C. Steere Elementary. We owe our story to the Shreveport-Bossier community, and we are grateful for the opportunity to continue that legacy of storytelling through our services. The Richard Creative team is proud to share our design for the 2017 Highland Jazz and Blues Festival poster! Highland Jazz & Blues Festival to Unveil 2017 Poster Design…by Richard Creative! Investing in our community is the heart behind Richard Creative. We choose local vendors and team members whenever possible, and could not be more proud to work with our local industry partners. Thomas Avallone is the Apple guru who has been many a designer’s lifeline in times of computer troubles. Jennifer LaPierre has the experience we trust for promotional products. Terri Hensley is just the solution for anything custom engraved, trophies, awards, and gift items. Robert is a no-nonsense technician who can diagnose problems, tell you what you need, and recommend the most reasonable plan of action for your IT problems. With a location literally just around the corner, this neighborhood, family print shop a local favorite. Ability Printing provides state of the art digital printing at nonprofit prices. Paragon Press benefits from generations of experienced design, print, and mail professionals. BNB Systems offers a broad diversity of printing and promotmions. Allegra printing and marketing is known for their great print work as well as their work done throughout our community. 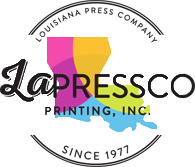 Excellent customer service and fast turnarounds are just a couple of reasons why LaPressco stands out as a local favorite.